Martin Claydon is a painter examining the space he inhabits. His relationship with the world is conveyed in his practise as he relates image and medium together. Martin is interested in the subject of his own life and unpacking his experience. His marks are made on surfaces that together speak of behaviours present in the world and call on us to assess where the boundaries should be set. British born, emigrating to Australia in his teenage years, identity and displacement play a large role in Martin’s practice. 14 years on he is making work that addresses British Colonial history in an honest way. Interested in what he can do to destabilise remaining cultural class systems, expose incorrect versions of history and alert to remaining signifiers. Martin is motivated by a responsibility to continue to correct, minimise and mock the impact British Imperialism had on this land and people past and present. Currently working with industrial painting materials Martin takes his work place experiences into the studio mixing high and low modes of art making. These conscious acts of delivery allow Martin to bring serious concerns to the table in an approachable and often light hearted way. References to Chroma key or Green-screen are prevalent throughout Martin’s work aiding to communicate ideas of cultural editing, isolation, manipulation and screening. Martin Claydon was born in England, emigrating to Australia in 2002. His degree in Fine Arts consisted of stints at the See Street Gallery School, Middlesex University London and the National Art School, where he completed his BFA (painting) in 2013. His work is held in public and private collections in both England and Australia, including the Sydney Town Hall archive and Lane Cove Council Chambers archive. In August 2015 he was awarded the Lloyd Rees Memorial Art Prize. 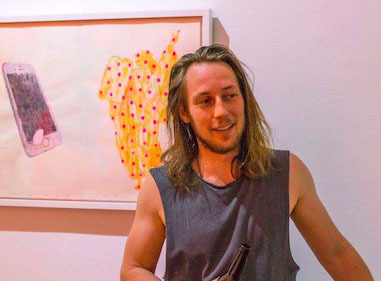 In 2018 he was a finalist in the Brett Whiteley Traveling Art Scholarship and the Black Swan Portrait Prize.